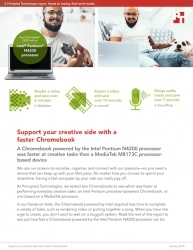 In hands-on tests, an Intel Pentium N4200 processor-powered Chromebook saved time rendering and exporting video, merging audio tracks, and more compared to a MediaTek M8173C processor-powered Chromebook. Durham, NC, February 01, 2018 --(PR.com)-- Creatives know the feeling of losing a great idea to a struggle with an unresponsive computer. Sluggish devices can slow creative work to a crawl until the muse leaves entirely.